Proprietary Name: Forteo What is the Proprietary Name? Non-Proprietary Name: Teriparatide What is the Non-Proprietary Name? Forteo with NDC 0002-8400 is a a human prescription drug product labeled by Eli Lilly And Company. 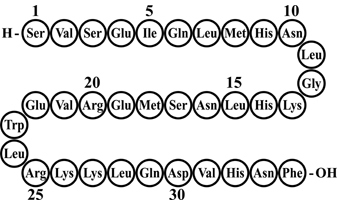 The generic name of Forteo is teriparatide. The product's dosage form is injection, solution and is administered via subcutaneous form. FDA Application Number: NDA021318 What is the FDA Application Number? Start Marketing Date: 11-26-2002 What is the Start Marketing Date? Why is teriparatide (rdna origin) injection medication prescribed? FORTEO should be administered initially under circumstances in which the patient can sit or lie down if symptoms of orthostatic hypotension occur [see Warnings and Precautions (5.7)].Parenteral drug products should be inspected visually for particulate matter and discoloration prior to administration, whenever solution and container permit. FORTEO is a clear and colorless liquid. Do not use if solid particles appear or if the solution is cloudy or colored. Treatment of Osteoporosis in Men and Postmenopausal WomenThe safety of FORTEO in the treatment of osteoporosis in men and postmenopausal women was assessed in two randomized, double-blind, placebo-controlled trials of 1382 patients (21% men, 79% women) aged 28 to 86 years (mean 67 years). The median durations of the trials were 11 months for men and 19 months for women, with 691 patients exposed to FORTEO and 691 patients to placebo. All patients received 1000 mg of calcium plus at least 400 IU of vitamin D supplementation per day. 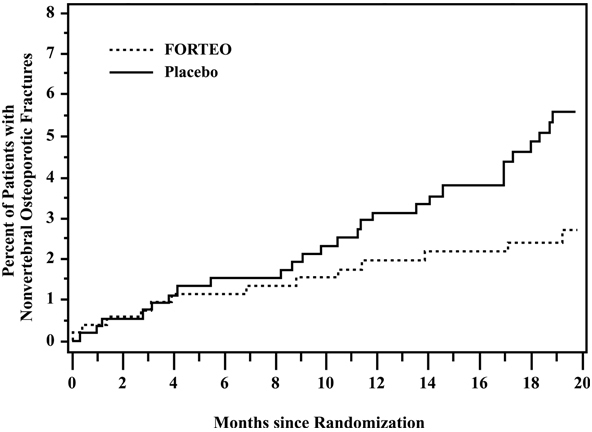 Studies in Men and Women with Glucocorticoid-Induced OsteoporosisThe safety of FORTEO in the treatment of men and women with glucocorticoid-induced osteoporosis was assessed in a randomized, double-blind, active-controlled trial of 428 patients (19% men, 81% women) aged 22 to 89 years (mean 57 years) treated with ≥ 5mg per day prednisone or equivalent for a minimum of 3 months. The duration of the trial was 18 months with 214 patients exposed to FORTEO and 214 patients exposed to oral daily bisphosphonate (active control). All patients received 1000 mg of calcium plus 800 IU of vitamin D supplementation per day. Bone HistologyThe effects of teriparatide on bone histology were evaluated in iliac crest biopsies of 35 postmenopausal women treated for 12 to 24 months with calcium and vitamin D and teriparatide 20 or 40 mcg/day. Normal mineralization was observed with no evidence of cellular toxicity. The new bone formed with teriparatide was of normal quality (as evidenced by the absence of woven bone and marrow fibrosis). Effect on Bone Mineral Density (BMD)In patients with glucocorticoid-induced osteoporosis, FORTEO increased lumbar spine BMD compared with baseline at 3 months through 18 months of treatment. In patients treated with FORTEO, the mean percent change in BMD from baseline to endpoint was 7.2% at the lumbar spine, 3.6% at the total hip, and 3.7% at the femoral neck (p<0.001 all sites). The relative treatment effects of FORTEO were consistent in subgroups defined by gender, age, geographic region, body mass index, underlying disease, prevalent vertebral fracture, baseline glucocorticoid dose, prior bisphosphonate use, and glucocorticoid discontinuation during trial. Marketed by: Lilly USA, LLCIndianapolis, IN 46285, USAwww.forteo.comCopyright © 2002, 2012, Eli Lilly and Company. All rights reserved. Osteosarcoma: Cases of bone tumor and osteosarcoma have been reported rarely in the postmarketing period. The causality to FORTEO use is unclear. Long term osteosarcoma surveillance studies are ongoing [see Warnings and Precautions (5.1)]Hypercalcemia: Hypercalcemia greater than 13.0 mg/dL has been reported with FORTEO use. Medication GuideFORTEO® (for-TAY-o)teriparatide (rDNA origin)injectionRead this Medication Guide before you start taking FORTEO® and each time you get a refill. There may be new information. Also, read the User Manual that comes with the FORTEO delivery device (pen) for information on how to use the device to inject your medicine the right way. This Medication Guide does not take the place of talking with your healthcare provider about your medical condition or your treatment. What is the most important information I should know about FORTEO?Possible bone cancer. During drug testing, the medicine in FORTEO caused some rats to develop a bone cancer called osteosarcoma. In people, osteosarcoma is a serious but rare cancer. Osteosarcoma has rarely been reported in people who took FORTEO. It is not known if people who take FORTEO have a higher chance of getting osteosarcoma. What is FORTEO?FORTEO is a prescription medicine that is like a hormone made by the body called parathyroid hormone or PTH. FORTEO may help to form new bone, increase bone mineral density and bone strength. Who should not use FORTEO?Do not use FORTEO if you:are allergic to any of the ingredients in FORTEO. See the end of this Medication Guide for a complete list of the ingredients in FORTEO. How should I use FORTEO?Inject FORTEO one time each day in your thigh or abdomen (lower stomach area). Talk to a healthcare provider about how to rotate injection sites. How should I store FORTEO?Keep your FORTEO delivery device in the refrigerator between 36° to 46°F (2° to 8°C). Keep FORTEO and all medicines out of the reach of children.General information about FORTEOMedicines are sometimes prescribed for purposes other than those listed in a Medication Guide. Do not use FORTEO for a condition for which it was not prescribed. Do not give FORTEO to other people, even if they have the same condition you have. What is Osteoporosis?Osteoporosis is a disease in which the bones become thin and weak, increasing the chance of having a broken bone. Osteoporosis usually causes no symptoms until a fracture happens. The most common fractures are in the spine (backbone). They can shorten height, even without causing pain. Over time, the spine can become curved or deformed and the body bent over. Fractures from osteoporosis can also happen in almost any bone in the body, for example, the wrist, rib, or hip. Once you have had a fracture, the chance for more fractures greatly increases. This Medication Guide has been approved by the U.S. Food and Drug Administration. *The brands listed are trademarks of their respective owners and are not trademarks of Eli Lilly and Company. Marketed by: Lilly USA, LLC, Indianapolis, IN 46285, USACopyright © 2002, 2013, Eli Lilly and Company. All rights reserved. FORTEO® (for-TAY-o) teriparatide (rDNA origin) injectionUser ManualImportant: First read the Medication Guide that comes inside your FORTEO carton.Before you use your new FORTEO delivery device, please read the entire front and back of this User Manual completely. Follow the directions carefully when using the FORTEO delivery device.Do not share your delivery device or needles because infection or disease can be spread from one person to another.The FORTEO delivery device contains 28 days of medicine. Throw away the FORTEO delivery device after 28 days, even if it is not completely empty. Do not inject more than one dose of FORTEO in the same day.Do not transfer FORTEO to a syringe.Wash your hands before every injection. Prepare the injection site as your healthcare provider instructed.1Pull off white capCheck the FORTEO delivery device label to make sure you have the right medicine and that it has not expired.Do not use if the FORTEO delivery device looks damaged, if the medicine in the cartridge is not clear and colorless, or if it has particles in it. Push needle straightonto medicine cartridge. Screw on needle clockwise until firmly attached. Pull off large needle cover and save it.3SetdosePull out black injectionbutton until it stops.If you cannot pull out the black injection button see Troubleshooting, Problem E, on back page. Check to make sure red stripe shows. Pull off small needle protector and throw away. 4Inject doseGently hold a fold of skin on your thigh or abdomen and insert needle straightinto skin. Push in black injection button untilit stops. Hold it in and count to 5slowly. You must wait until the count of 5 to make sure you receive the correct dose. Then pull the needle from skin. 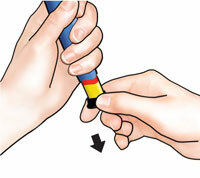 IMPORTANT5ConfirmdoseAfter completing the injection:Once the needle is removed from the skin, take your thumb off the black injection button. Check to make sure the black injection button is all the way in. If the yellow shaft does not show, you have finished the injection steps the right way. You should NOT see any of the yellow shaft. If you do and have already injected the medicine, do not inject yourself a second time on the same day. Instead, you MUST reset the FORTEO delivery device (see Troubleshooting, Problem A, on back page). 6Remove needlePut large needle cover on needle. Do not try to put the needle cover back on with your hands. 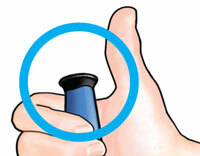 Unscrew the covered needle all the way by giving the large needle cover 3 to 5 counter-clockwise turns. Pull off needleand throw away in a puncture-resistant container. Push white cap backon. Right after use, place FORTEO delivery device in the refrigerator.For more information, or if you have any questions, turn to the back of this page.FORTEO® (for-TAY-o) teriparatide (rDNA origin) injectionTroubleshootingProblemSolutionA. The yellow shaft is still showing after I push in the black injection button. How do I reset my FORTEO delivery device?To reset the FORTEO delivery device, follow the steps below. If you have already injected, DO NOT inject yourself a second time on the same day. Remove the needle. Point the needle down into an empty container. Push in the black injection button until it stops. Hold it in and slowly count to five. You may see a small stream or drop of fluid. When you have finished, the black injection button should be all the way in.If you still see the yellow shaft showing, contact Eli Lilly and Company (see Contact Information below) or your healthcare provider. Put the large needle cover on needle. 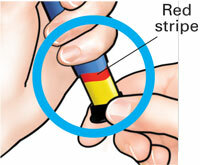 Unscrew the needle all the way by giving the needle cover 3 to 5 counter-clockwise turns. 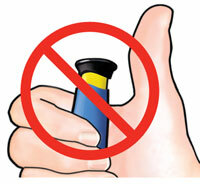 Pull off the covered needle and throw away as instructed by your healthcare provider. Push the white cap back on, and put your FORTEO delivery device in the refrigerator.You can prevent this problem by always using a NEW needle for each injection, and by pushing the black injection button all the way in and slowly counting to five.B. How can I tell if my FORTEO delivery device works?The black injection button should be all the way in to show that the full dose of medicine has been injected from the FORTEO delivery device. I see an air bubble in my FORTEO delivery device.A small air bubble will not affect your dose and it will not harm you. You can continue to take your dose as usual. I cannot get the needle off. If you still cannot get the needle off, ask someone to help you.E. What should I do if I have difficulty pulling out the black injection button?Change to a new FORTEO delivery device to take your dose as instructed by your healthcare provider.When the black injection button becomes hard to pull out, this means there is not enough medicine in your FORTEO delivery device for another dose. You may still see some medicine left in the cartridge. Cleaning and StorageCleaning Your FORTEO Delivery DeviceWipe the outside of the FORTEO delivery device with a damp cloth. Do not place the FORTEO delivery device in water, or wash or clean it with any liquid.Storing Your FORTEO Delivery DeviceAfter each use, refrigerate the FORTEO delivery device right away. Read and follow the instructions in the Medication Guide section “How should I store FORTEO?”. If the FORTEO delivery device has been left out of the refrigerator, do not throw the delivery device away. Place the delivery device back in the refrigerator and call Eli Lilly and Company at 1-866-4FORTEO (1-866-436-7836).Other Important NotesThe FORTEO delivery device contains 28 days of medicine. 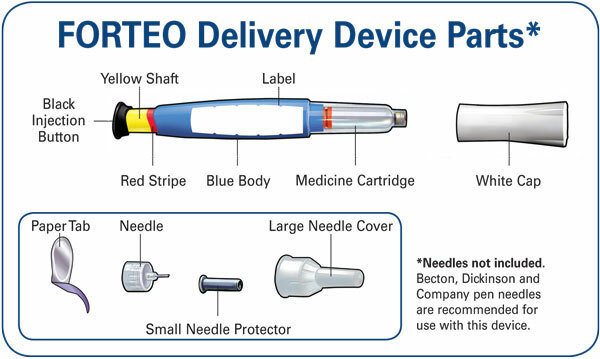 Keep your FORTEO delivery device and needles out of the reach of children.Disposal of Pen Needles and Delivery DeviceDisposal of Pen Needles and the FORTEO Delivery DeviceBefore throwing away the FORTEO delivery device, be sure to remove the pen needle. Throw away your FORTEO delivery device and used needles as instructed by your healthcare provider, local or state laws, or institutional policies.Dispose of the FORTEO delivery device 28 days after first use.1st use date ______ / ______ / ______Throw away after ______ / ______ / ______Contact InformationIf you have questions or need help with your FORTEO delivery device, contact Eli Lilly and Company at 1-866-4FORTEO (1-866-436-7836) or your healthcare provider.